Cristiano Ronaldo scored two late goals as Real Madrid - who had Gareth Bale sent off - came from 3-1 down to draw with Las Palmas at the Bernabeu. Kevin-Prince Boateng fired in moments later before Ronaldo's penalty and header earned Real a point. Real Madrid's comeback was not enough to send them back to the top of La Liga. They now trail Barcelona by one point, although they have a game in hand on the champions. Three days after Zinedine Zidane's side performed a great escape by coming from 2-0 down to defeat Villarreal, they produced a similar trick again. 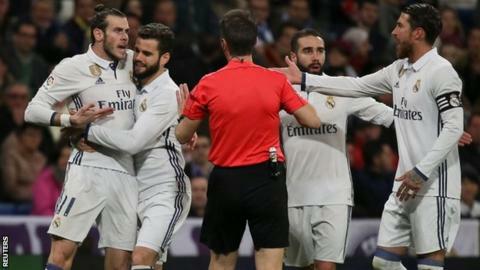 After Bale was sent off for an out-of-character shove, Las Palmas took advantage of the shell-shocked home side when Viera fired in from the spot after Ramos had handled David Simon's drive inside the area. With seconds of the match remaining, the Portugal forward, who appeared frustrated during the night, rose brilliantly to head in Rodriguez's cross. Match ends, Real Madrid 3, Las Palmas 3. Second Half ends, Real Madrid 3, Las Palmas 3. Tana (Las Palmas) wins a free kick in the attacking half. Alen Halilovic (Las Palmas) is shown the yellow card. Corner, Las Palmas. Conceded by Sergio Ramos. Goal! Real Madrid 3, Las Palmas 3. Cristiano Ronaldo (Real Madrid) header from the centre of the box to the high centre of the goal. Assisted by James Rodríguez with a cross following a corner. Corner, Real Madrid. Conceded by Mauricio Lemos. Corner, Real Madrid. Conceded by Dani Castellano. Goal! Real Madrid 2, Las Palmas 3. Cristiano Ronaldo (Real Madrid) converts the penalty with a right footed shot to the top right corner. Penalty conceded by Dani Castellano (Las Palmas) with a hand ball in the penalty area. Attempt saved. Jesé (Las Palmas) right footed shot from the right side of the box is saved in the top right corner. Assisted by David Simón. Attempt missed. James Rodríguez (Real Madrid) right footed shot from the left side of the box is high and wide to the right. Assisted by Karim Benzema. Foul by Jesé (Las Palmas). Attempt saved. Daniel Carvajal (Real Madrid) right footed shot from the right side of the box is saved in the centre of the goal. Assisted by Lucas Vázquez. Corner, Real Madrid. Conceded by Aythami Artiles. Attempt blocked. Karim Benzema (Real Madrid) left footed shot from the centre of the box is blocked. Assisted by James Rodríguez with a headed pass. Attempt missed. James Rodríguez (Real Madrid) left footed shot from outside the box misses to the right. Cristiano Ronaldo (Real Madrid) is shown the yellow card. Cristiano Ronaldo (Real Madrid) has gone down, but that's a dive. Attempt saved. Jesé (Las Palmas) right footed shot from the right side of the box is saved in the centre of the goal. Assisted by David Simón. Tana (Las Palmas) wins a free kick in the defensive half. Dani Castellano (Las Palmas) wins a free kick on the left wing. Attempt missed. Alen Halilovic (Las Palmas) left footed shot from outside the box is high and wide to the left. Attempt saved. Lucas Vázquez (Real Madrid) right footed shot from the left side of the box is saved in the centre of the goal. Assisted by Marcelo. Substitution, Las Palmas. Alen Halilovic replaces Jonathan Viera.